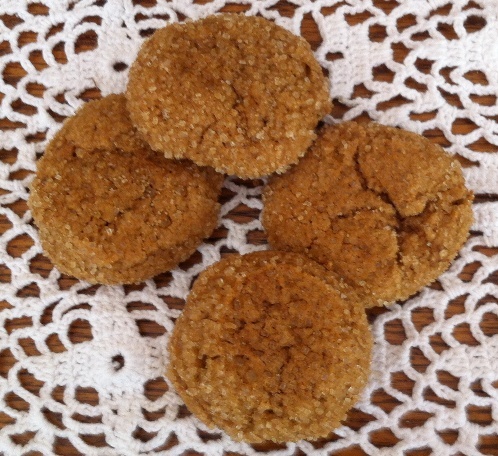 Molasses Cookies were originally baked as individual gingerbread cakes, rolled and cut into small rounds. Molasses is a brown, thick, bittersweet syrup that is the byproduct of sugar cane refinement. Earliest recipes, dating back to the nineteenth century, call for just molasses and spices as flavorings. As a sweetener, molasses was the preferred choice, particularly among Americans, until the turn of the twentieth century. After World War I, the price of refined sugar dropped and molasses consumption went down. Today’s recipes combine molasses, granulated sugar, and in some cases brown sugar, as sweeteners in these cookies. In a medium bowl, combine flour, baking soda, salt, ginger, cinnamon, and ground cloves. Set aside. In a separate bowl, cream together melted butter, sugar, and molasses until well blended. Beat in egg. Gradually mix the flour mixture to the butter mixture, adding a bit at a time until well combined. Remove the dough from the refrigerator. Shape the dough into 1-inch balls. Roll each ball in coarse sugar. Arrange balls on an ungreased cookie sheet, 2 inches apart. Press each ball lightly with the heel of your hand. If you prefer a softer consistency in your Molasses Cookies, bake them just shy of 10 minutes. For a crisper cookie, bake a minute or two longer.